54 a-e-mag.com • A&E OCTOBER 2018 Within a business, consistency means establishing a set of standards that are fol- lowed by everyone within the organization. In addition, the organization itself follows the same path, and this creates efficiency. Consistency needs to be pervasive on all levels, from the service level that is provided to customers to the set of standards that all employees follow within the organization. Having standardized processes in effect for all employees to follow not only ensures that things move in the direction set by management, but creates criteria by which employee performance can be measured. In addition, it creates structure, which employees generally embrace. IT BEGINS AT THE TOP Consistency is established from the top, down. Executive management must set a tone and standards for everyone to follow, then needs to lead by example. When upper management is guided by a set of standards, then it becomes easier to lead others, as they are more receptive to following the same standards. Good leaders must practice what they preach. This is not to say that things will not periodically change; however, when they do, it is imperative that management communicates these changes clearly and effectively to employees. A clear set of standards creates structure, and employees are more apt to thrive within a structured environment. Structure and consistency also allow for clear measurement. This is important for I n any kind of growing business, things can get hectic and out of kilter. When this happens, it becomes difficult to establish a culture of consistency. This lack of consistency can negatively impact a business in many ways, yet it is often overlooked in favor of what seems to be important at the moment. 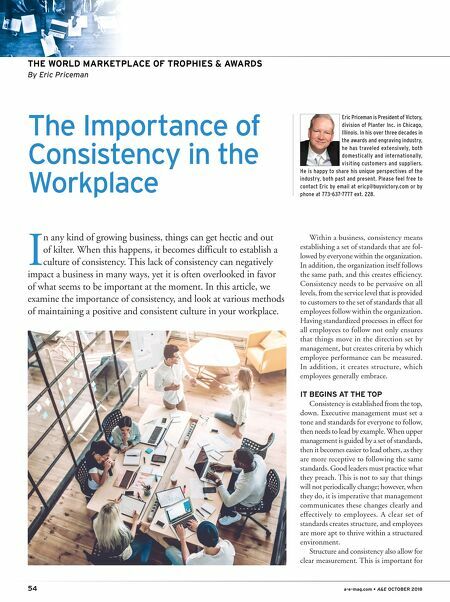 In this article, we examine the importance of consistency, and look at various methods of maintaining a positive and consistent culture in your workplace. The Importance of Consistency in the Workplace THE WORLD MARKETPLACE OF TROPHIES & AWARDS By Eric Priceman Eric Priceman is President of Victory, division of Planter Inc. in Chicago, Illinois. In his over three decades in the awards and engraving industry, he has traveled extensively, both domestically and internationally, visiting customers and suppliers. He is happy to share his unique perspectives of the industry, both past and present. Please feel free to contact Eric by email at ericp@buyvictory.com or by phone at 773-637-7777 ext. 228.